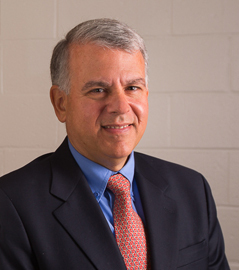 After earning his BA from Georgetown University and his MA and PhD from Harvard University, Joseph Bartolomeo joined the UMass Amherst Department of English in 1986. From 2007 to 2013, he served as chair of the department. During his tenure, the department hired ten new faculty members, successfully completed an AQAD review, and was ranked highly in the campus’s review of Ph.D. programs. He also served from 2010 to 2013 as Chair of the Rules Committee of the Faculty Senate, and from 2003 to 2013 as the Faculty Representative to the UMass Amherst Foundation Board. He was a member of the search committees for the current Chancellor and two current Vice-Chancellors, and since 2000 has been Secretary of the campus Chapter of Phi Beta Kappa. As Associate Dean for Operations and Planning, Professor Bartolomeo is responsible for overseeing the College of Humanities and Fine Arts' programs in Continuing and Professional Education, working with the Facilities Coordinator and Campus Planning to maintain and improve our facilities, representing the College on two major construction projects—the South College Academic Facility and the Integrated Design Building—and assisting with strategic planning and resource allocation. His principal research interest is eighteenth-century British literature, with particular focus on the novel, gender, and transatlanticism. He is currently working on a study of representations of America and Americans in British fiction published during the politically turbulent 1790s. He was elected to two terms on the Executive Board of the Northeast American Society for Eighteenth-Century Studies, and served as eighteenth-century field editor for the Twayne English Authors Series. Edition of Susanna Rowson, Reuben and Rachel (1798). Peterborough, ON: Broadview Press, 2009. Matched Pairs: Gender and Intertextual Dialogue in Eighteenth-Century Fiction. Newark: University of Delaware Press, London and Toronto: Associated University Presses, 2002. A New Species of Criticism: Eighteenth-Century Discourse on the Novel. Newark: University of Delaware Press, London and Toronto: Associated University Presses, 1994. "'New People in a New World’? : Defoe’s Ambivalent Narratives of Emigration." Eighteenth-Century Fiction 23:3 (Spring 2011): 455-70. "Teaching the Rise of the Transatlantic Novel." Teaching the Transatlantic Eighteenth Century. Ed. Jennifer Frangos and Cristobal Silva. Newcastle: Cambridge Scholars Press, 2011. 185-96. "A Fragile Utopia of Sensibility: David Simple." Gender and Utopia in the Eighteenth Century: Essays in English and French Utopian Writing. Ed. Brenda Tooley and Nicole Pohl. Aldershot: Ashgate Press, 2007. 39-52. "Restoration and Eighteenth-Century Satiric Fiction." A Companion to Satire, Ancient and Modern. Ed. Ruben Quintero. Oxford: Blackwell Publishing, 2006. 257-75.